This chapter helps you get in the mood (terminally bored, ready to have a root canal rather than think about grammar one more minute) for the SAT multiple-choice writing sections. Here, you find error-recognition, sentence-revision, and paragraph-revision sample questions. All are accompanied by answers and explanations, and I promise not to say, “Because I said so,” when I explain why a particular answer is correct. After each answer explanation in this chapter, I state in parentheses which grammar principle is being tested. If you need a more complete review, turn back to Chapter 9 and review the relevant section. If your grammar skills need more than a touch-up, feel free to inflate my ego by consulting English Grammar For Dummies, 2nd Edition, and English Grammar Workbook For Dummies, 2nd Edition (Wiley), both by yours truly. The SAT (Slow And Time-consuming) directions tell you to choose an underlined portion of the sentence that contains an error and to bubble in the corresponding letter. The last choice — (E) — always stands for no error. As you work on these sample problems, keep in mind that you’re checking for grammar, punctuation, and word use. Forget about capitalization and spelling, which aren’t covered on this exam. Also, assume that everything that’s not underlined is correct. In the first set, the answer immediately follows each question, so use a piece of paper to cover up the answer while you work on the question. In the second set, which is set up like the real test, the answers are all together at the end. Okay, if you correctly answered about 50 percent, you’re on track for a fairly good score. Of course, keep at it and aim for higher. Analyze your mistakes, reread the appropriate explanations in Chapter 9, and then hit the second set. Once more onto the analyst’s couch: Check what type of question tripped you up and go back over the explanations in Chapter 9. In this sort of question you’re not just looking for grammar mistakes; you’re also aiming for style. Choice (A) is always the underlined part of the sentence, repeated without any changes. If you think the sentence sounds fine, bubble in (A) and be done with it. Otherwise, reword the sentence in your mind and try to find an answer that fits. If nothing fits your imaginary revision, check out the SAT’s offerings and choose the one that sounds best. Set 1 gives you the answers after each question; Set 2, which is set up like the real test, gives you the answers at the end. Even after you’ve found the correct answers, squeeze out a couple of seconds to review the explanations that follow the questions. I have taken care to include a couple of ­frequently tested ideas in this section that didn’t merit a full-blown discussion in Chapter 9. Reading the explanations will help you pick up grammar issues that may show up on the real SAT. 1. Dancing in local productions, singing in the homecoming show, and music lessons all paved the way for her career in the arts. 2. In the newspaper it says that the egg hunt will be held outdoors only if the weather ­cooperates. 3. The plot of the drama was so intriguing that Annie didn’t realize until the final curtain how much time it was that had passed. 4. Stirring the batter vigorously, a tasty cake will result, even for amateur bakers. 5. Either the puppies or the dog trainer is to be commended for the excellent behavior of the pack. 6. The mayor told us citizens that the responsibility for public safety was to be shouldered by him. 7. Alex told us that there is a good reason for him accepting blame for the fire. 8. That art historian maintains that only the painter can interpret his work, consequently the art gallery must use the catalog the scholar prepared or nothing at all. 1. The business executive spoke continually for seven hours with whomever would listen until the problem with the company’s cash shortage was resolved. 2. My sister, barely able to speak and sniffing furiously, told me that she has a cold. 3. Everyone should have brought their best clothes to the dance competition in order to make a good impression on the judges. 4. The trophy should be awarded to the best athlete, the same standards applying to everyone who plays on the team. 5. When one is ready to enter college, you should have the ability to write a good essay. 6. Mary told her aunt that she should not wear black because it is a gloomy color. 7. The principle of the school must maintain an attitude of dignity, even when pupils misbehave. 8. Having read the report, John immediately took steps to correct the problem. This type of question presents a piece of writing that a fellow student may have produced. As a first draft, it has some grammar and style problems. Each sentence is numbered, and the whole thing is followed by a set of questions with answers and explanations. Take a crack at the first set, which provides the answer after each question, review your problem areas, and then hit the second set, which is set up like the real test and provides all the answers at the end. 1. Which of the following is the best revision of the underlined portion of Sentence 1? When I was about two years old, my mother made me eat lima beans, which apparently annoyed me so much that I frowned at her the rest of the day. 2. In the context of the first paragraph, how should Sentence 5 be revised? (A) You can’t tell what you will think in the future, so you should be careful not to rule out the possibility of change. (B) No one can tell what he or she will think in the future, so everyone should be careful not to rule out the possibility of change. (C) What you think might be a mystery tomorrow, so don’t rule out change. (D) You may change in ways you can’t foresee, don’t rule out new ideas. (E) No one knows how they will change, especially in terms of ideas. 3. How may Sentences 8 and 9 best be combined? (A) After all, new information may change your mind and different experiences can also change the way you think. (B) After all, new information may change your mind, and different experiences can also change the way you think. (C) After all, new information may change your mind; different experiences can also change the way you think. (D) After all, new information and experiences may change the way you think. (E) After all, new information may change your mind, like different experiences do. 4. What is the best revision of Sentence 11? (A) Being in a democracy, openness to ideas are more important than anything else. (B) Openness to ideas is more important than anything else because of democracy. (C) Being in a democracy, you should have openness to ideas more than anything else. (D) In a democracy, openness to ideas is an extremely important quality. (E) Being in a democracy, openness to ideas is needed more than anything else. 5. What is the best revision of Sentence 15? (A) If I would choose without thought, I would not have done my duty as a citizen. (B) If I had chosen without thought, I would not have done my duty as a citizen. (C) Choosing without thought had been wrong, as a citizen. (D) If I would have chosen without thought, I should not have done my duty as a citizen. (E) Had I chosen without thought, my duty as a citizen would not have been done. 1. What is the best revision of Sentence 2? 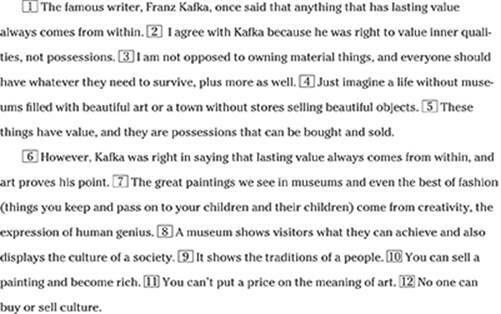 (B) Kafka was right to not value possessions but to value inner qualities instead. (C) Kafka rightly values inner qualities more than possessions. (D) Kafka, not valuing possessions, values inner qualities. (E) Inner qualities, not possessions, are valued by Kafka. 2. Which of the following is the best change to Sentence 3? (D) Add a comma and “such as art” to the end of the sentence. 3. In the context of the essay, what is the function of Sentence 6? 4. Which sentence in the second paragraph (Sentences 6–12) may be omitted without weakening the writer’s argument? 5. How may Sentences 10 and 11 best be ­combined? (A) You can sell a painting and become rich, but you can’t put a price on the meaning of art. (B) Selling a painting and becoming rich, you can’t put a price on the meaning of art. (C) You can sell a painting, but you can’t put a price on the meaning of art, even if it makes you rich. (D) Selling a painting, you become rich, and you can’t put a price on the meaning of art. (E) As you sell a painting and become rich, you can’t put a price on the meaning of art. 6. What is the best way to improve the third paragraph (Sentences 13–16)? (C) Add “because he explains the value of art” to the end of Sentence 13. (D) Combine Sentences 14 and 15. (E) Add a sentence that does not refer to art as an example of Kafka’s ideas. The eu family has nothing in common with ew, the sound you make when a bug crawls up your sleeve. Eu is a Greek prefix that means good or pleasant. Easy-listening tunes are euphonious (they sound good) and eulogies are speeches in which all (and only) good things are said about someone (they’re usually given in honor of the deceased at a funeral or memorial service). A euphemism is a more pleasant term that may substitute for a word you don’t like to say, such as the substitution of restroom for toilet. The anthros are the family of man (and woman). An anthropologist studies human behavior and society, but a misanthrope hates people. If you dress your dog in little dresses (pause for a shudder and a call to the humane society), you’re guilty of anthropomorphism — projecting human qualities onto nonhumans.